I got up early yesterday to see the eclipse of the moon. It was called a Super Moon Blood Moon. The moon is closer to earth and brighter than usual, it's the second full moon of the month, and there is an eclipse. This hasn't happened since 1982 and the last time it was visible to the U.S. was 1866. It won't happen again until 2037. I made a new recipe. The photo doesn't do it justice. 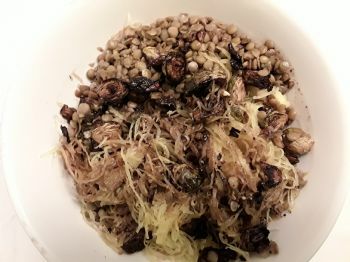 It is spaghetti squash, lentils, and roasted brussels sprouts with a balsamic vinaigrette. It was good. I love a SparkPeople lentil soup recipe I've made a couple times but I think if I made this again, I'd leave out the lentils. (I'll save my lentils for the soup). The squash, roasted brussels sprouts, and balsamic vinaigrette were good. I am sick. It had been nearly 3 years since I've had to go on an antibiotic for these horrible sinus infections I get. (I've been hospitalized before.) I tried to fight it but am glad after the 3rd day on the antibiotic that I caved. I feel so much better! If I didn't work fulltime, bring work home to do,and have events evenings and weekends that are work related I would've fought this with rest. But I don't have the luxury of peaceful weekends. Last week I had a class two nights and stayed late at work a third night. (No wonder I got worn down.) So, I thank the Lord for antibiotics! Once I feel better I am going to get back to exercise and track everything I eat, staying in my range. It's time to get serious. It was too cloudy to see the moon here in Michigan. Hope you are up and at 'em today (well, it's 7a here...you can be up and at em in a couple hours!). Hope you kick the infection soon! I hope you are on the mend. Take care of yourself. Take care of yourself. Glad the meds are working for you! The super blue blood moon was amazing. I ready that all of them with an eclipse they are not sure when it will happen again, that in 1866 it was not all 4 events at once. I watched the eclipse, it was a great view from our 18th floor office. I get to work at 6 am and it was about a quarter of the way through. I saw the moon last night and it was so bright and large! Just gorgeous!! Yes, that's interesting. hope you feel better-be sure it's not the flu,though....it's good to experiment with different recipes...I love lentils, though, so might try that soup you referred to! that's the one thing I don't like about lentils. They make the brightest, most colorful dishes brown. But they taste good and are so good for you. Hope you get better and get back to it soon.